Cut the shape of a guitar out of card stock. 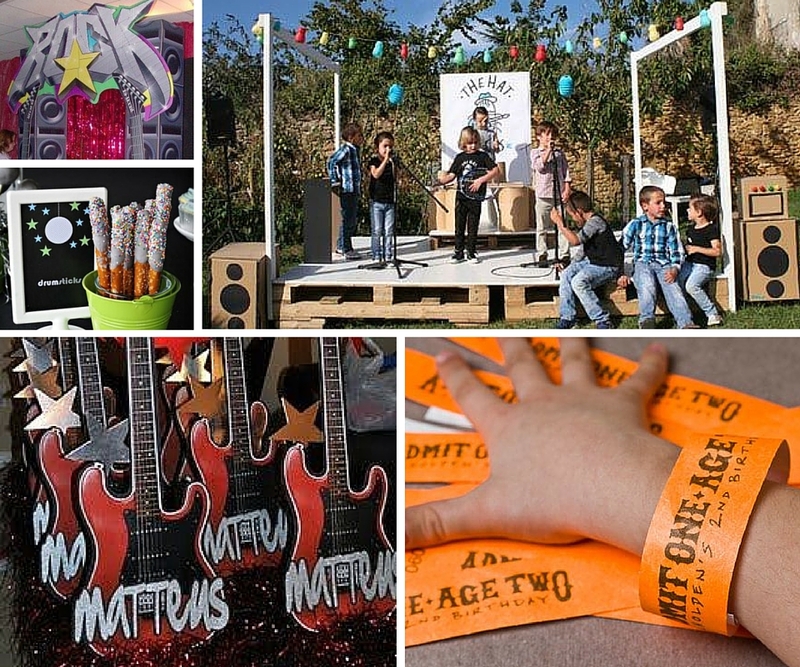 Write "Rock the House at [child's name]'s Party!" on the front and all the party details on the back. Design each invitation to look like a CD. Use empty CD cases to hold the invites, cutting each one to size and inserting it into a case. Paste a photo of your child's favorite singer or group onto the bottom of an 8 1/2" x 11" piece of paper. Write the party details above the photo and decorate with stickers. Roll up each invitation and wrap a rubber band around it to resemble a concert poster. Design your invitations to look like concert tickets, with a perforated line on one end. Tear that end off of each guest's ticket when they arrive at the party. It's Michael's birthday, and it's time to rock, We won't stop dancing 'till ten o'clock, You're on "the list" so don't be tardy, Andcome prepared to party hardy! If you would rather not make your own invitations, but would still like a personalized touch, considerpersonalized invitations, which can be customized with all of your details! Run a red carpet up to your door using a roll of red gift wrap. Draw a line of large stars on the driveway using chalk, and write guests' names on each star. Hang a banner on your front door that says "Rock Concert Tonight - Sold Out!". 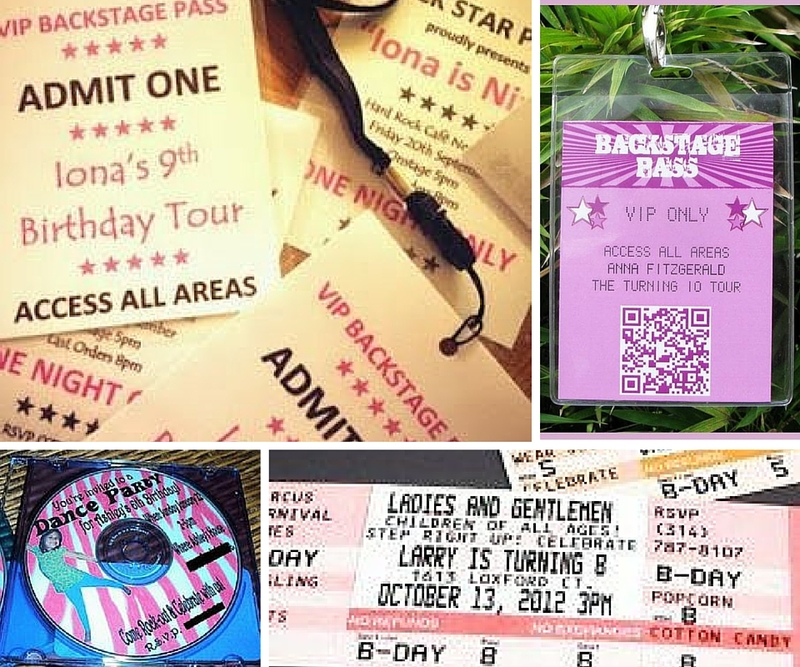 Use ourpersonalized bag tagsas "Backstage Passes" and hand one to each guest as they arrive. Create a stage area where your guests can sing and dance by hanging a plain white sheet on one wall of the party area and painting large black speakers on both sides. Outline the sheet with clear lights. Hang posters of famous singers and groups around the party area. Write your guests' names on stars and hang them from the ceiling. Make signs for any closed doors viewed from the party area with phrases like "Dressing Room," "Sound Stage," and "Recording Studio." Serve french fries and popcorn instadium cups. Set out toppings for the popcorn such as cheese powder, cinnamon and sugar, caramel sauce, and sea salt. Serve sparkling cider in plastic champagne glasses. Use star-shaped cookie cutters to cut sandwiches, cheese and deli meat. Serve on a platter with fruit and crackers. Set out a bowl filled with packages of Pop Rocks candy. Put out candy necklaces, rings, and bracelets for the guests to wear and snack on. Serve Ice Cream Cone Microphones by putting ice cream in sugar cones and topping them with chocolate sprinkles. Serve CD Sugar Cookies by frosting round sugar cookies in white frosting and piping on the details, such as the center hole and the band name, in black decorator frosting. Make a star-shaped cake with astar cake pan and pipe on words like "You're a Star!" or "Let's Party!" in decorator icing. 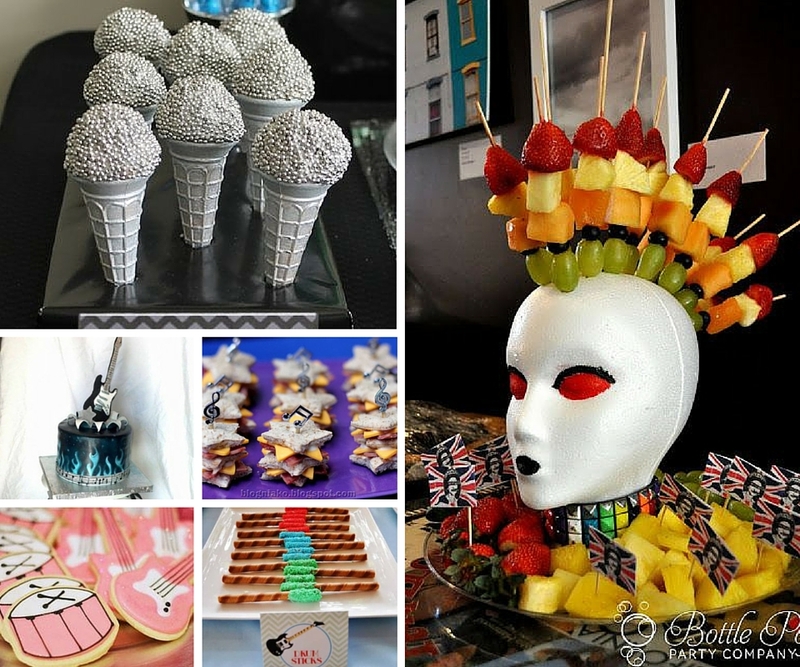 As an alternative to cake, try serving chocolate fondue with fruit, pretzel rods, marshmallows, and other treats for dipping. You can also opt for complete favor sets and personalized products such as zipper pulls, bookmarks, and buttons. 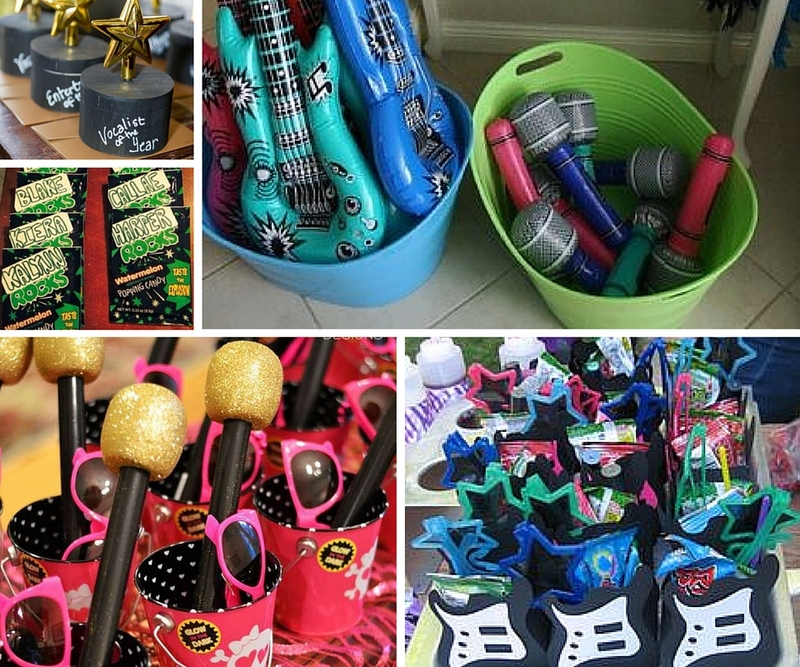 For more Rock Starideas, check us out on Pinterest. 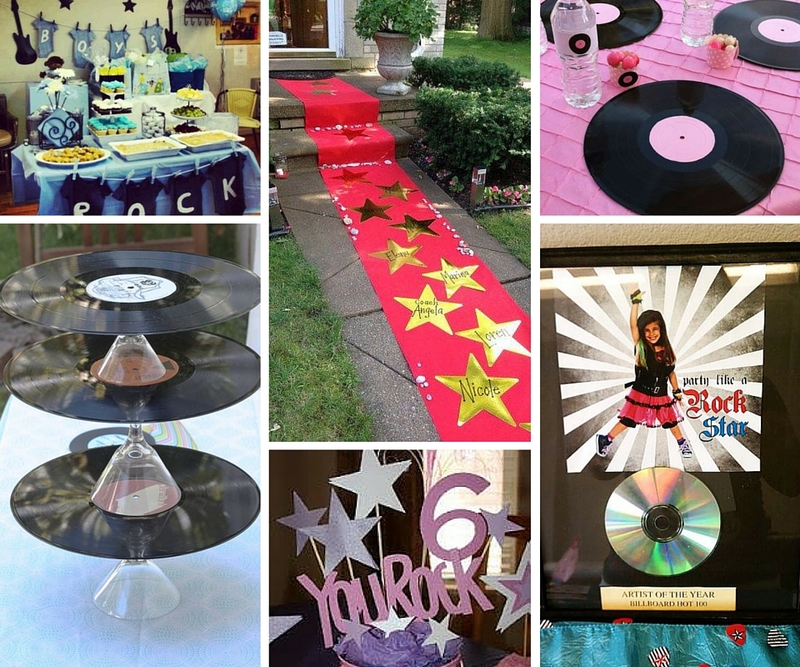 Rock Star Party Supplies: Includes paperware, invitations, personalized items, favors, and decorations for your party theme. Personalized Items: Check out our exclusive personalized items including invitations, bookmarks, stickers, and more!